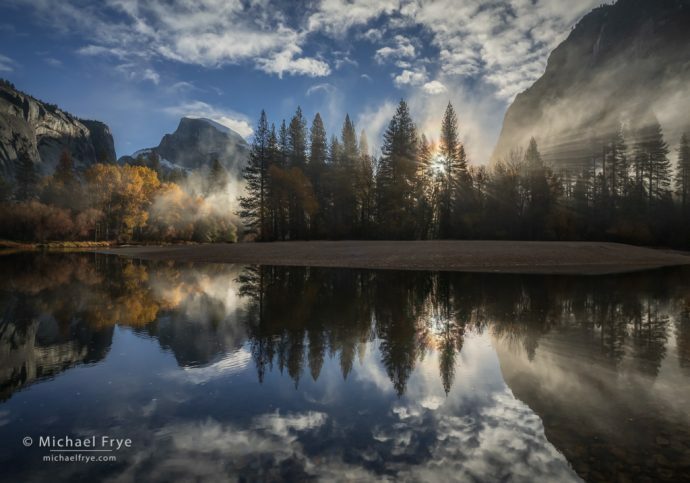 Misty sunrise, Half Dome and the Merced River, Yosemite. This was a very contrasty scene, so I bracketed five exposures, each two stops apart, and blended them with Lightroom’s HDR Merge. The settings, for what they’re worth: 16mm, various shutter speeds at f/11, ISO 100. I don’t like getting up early. I’m really more of a night owl, and it’s always an unpleasant shock when the alarm jars me out of a deep sleep at oh-dark-thirty. But I force myself to rise early any time there’s a chance for an interesting sunrise, because if I don’t I might miss something special, and then I would kick myself. After a very dry autumn we finally got two storms last week. The second storm moved through on Friday and Friday night. All signs indicated that it would clear sometime around sunrise yesterday (Saturday), which could be great timing. So I set my alarm for 4:30 a.m., pried myself out of bed, made some breakfast, and drove to Yosemite Valley. Of course even after I’m up and on the road I wonder whether the lack of sleep and long drive will be worth it, or whether I should have stayed in bed. While there are always things to photograph, anytime, anywhere, you hope for something special. And by definition, special conditions don’t occur frequently. There have been plenty of mornings when I’ve risen early for sunrise, and thought later that perhaps more sleep would have been a better choice. But you never know unless you get out there. And every so often you get to photograph a really beautiful, special sunrise, and you remember why you keep getting up early and trying – and why you photograph landscapes in the first place. Saturday morning was like that. It was one of those magical Yosemite days when I wished I could be in twelve places at once, or have a universal remote with a pause button so I could stop time and run around taking photos. Lacking the ability to clone myself or pause the universe, I began at Tunnel View, then worked my way around Yosemite Valley, trying to put myself in the right places at the right times to catch moments when the sun first reached the valley floor. The ground and trees were soaking wet after three inches of rain, so when the sun would hit a spot for the first time it would evaporate that moisture, creating wonderful mist, and a succession of beautiful scenes. One of my first stops was a view of Half Dome with the Merced River in the foreground. I got there just in time to catch the sun breaking through the mist, casting sunbeams and creating a beautiful corona. To top it off, the cottonwoods below Half Dome still had color, and some wonderfully-patterned clouds were passing overhead and reflecting in the water. I’ve photographed misty sunrises from this spot before, but never quite like this. 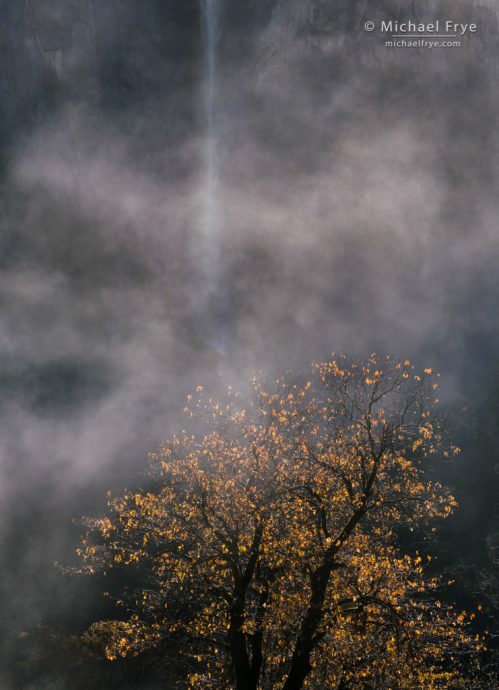 Later, when the sun reached El Capitan Meadow, I photographed pines, oaks, and mist with lovely backlight. And continuing around the valley I found backlit mist and oaks below Bridalveil Fall. This kind of run-around-and-try-to-catch-everything photography doesn’t suit everybody. It’s easy to get scattered, and make mistakes, and end up taking a bunch of good-but-not-great photos, when it might have worked better to stay longer in one or two locations and make fewer images, but concentrate on making those few images really good. I sometimes find myself chasing fog, or a rainbow, and later wish I had stayed in one place. But yesterday morning I could chase the mist without feeling too rushed or scattered because I had photographed Yosemite Valley under similar conditions before, and was able to anticipate the light, rather than just react to it. It always helps to know an area well, so you can better predict what the weather might do, how the light will change, and what spots might work best under certain conditions. And it’s easier to concentrate on what’s in front of you when you’re not second-guessing yourself and wondering if the light might be better somewhere else. Any time you’re reacting to quickly-changing conditions it also helps know your camera well, and have a solid routine for taking photos. Having a routine, or a field workflow, means doing things in the same order every time you take a picture, so you can avoid getting flustered and forgetting something important. After running around familiar-as-the-back-of-my-hand Yosemite Valley yesterday morning I finally tore myself away after the last of the mist dissipated around 11 a.m. But it was a great morning, and a reminder of why I love landscape photography. What other activity pushes you to go to beautiful places at their most beautiful moments – and makes rising at 4:30 a.m. seem worthwhile? I’ll try to think about that the next time the alarm wakes me out of a deep sleep in the middle of the night! Sunrise from Tunnel View, Yosemite. Another exposure blend, this time three frames, two stops apart, again blended with Lightroom’s HDR Merge. 31mm, various shutter speeds at f/11, ISO 100. 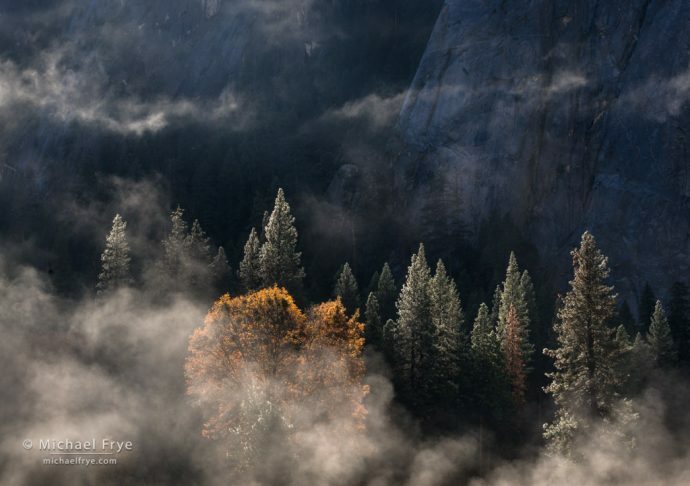 Mist, trees, and Middle Cathedral Rock, Yosemite. The mist was moving rapidly, requiring frequent changes in composition and lots of frames. 75mm, 1/20th of a second at f/11, ISO 100. Oak, mist, and Bridalveil Fall, Yosemite. Again, the mist was moving quickly, so I needed many frames to catch an interesting mist pattern that didn’t obscure the waterfall too much. 120mm, 1/125th of a second at f/16, ISO 200. Related Posts: Chasing Fog; Should I Stay or Should I Go? 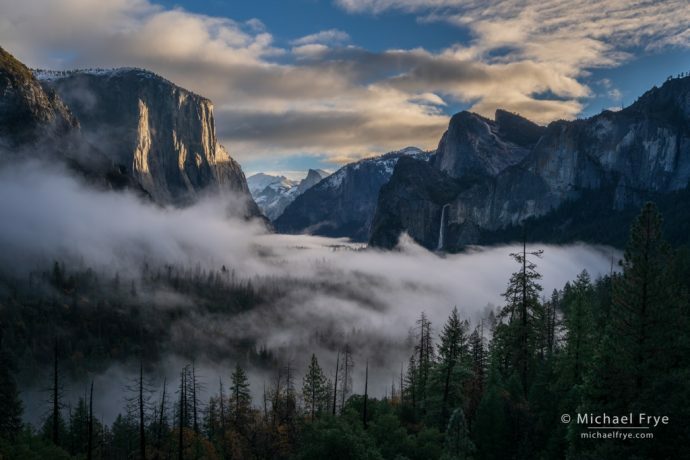 The Oak, Mist, and Bridalveil image is one you’ve shot before. I think. (I have it on my wall) But it has a different look and feel, despite being shot from what appears to be nearly the same place. 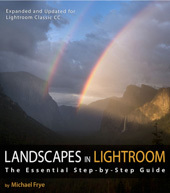 If anyone wonders how you’ve made a lifetime out of shooting Yosemite, show them these. 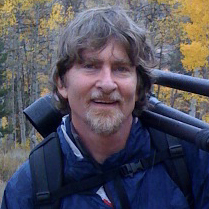 Yes, I sometimes have to copy myself after all these years photographing Yosemite. 🙂 But as you said, it has a different look and feel. Thank you for sharing this stunning image as well as your techniques in producing it. The glorious feeling of your photo mirrors how I feel about the return of the RAIN to California- inspiring! Great shots. Its great to live to so close to such a beautiful place. But of course, there are so many beautiful places close to about everybody. One of the best pictures ever in the valley, you keep topping yourself, congrats and thanks for sharing everything! I love your work Michael and my favorite from this series is Misty sunrise. This is how a HDR image should be done. Welcome winter. It is great to finally get the first winter storm at Yosemite. Michael, you captured it beautifully. Thank you for sharing! I like the picture at the top very much. It is nice to finally see some storms, and there are more in the forecast. Glad you like the photo Hong! Beautiful composition and thanks for getting up early and taking advantage of the weather conditions. This makes me want to come to Yosemite and capture some of these iconic views. Not that I will be able to compete with these images – grin. Thanks very much Charles! Yosemite is pretty great. Thanks for sharing these beautiful images, Michael. Yosemite looks gorgeous! Wonderful to see rain and snow back in California. Hope you had a nice Thanksgiving! A wonderful set of images, Michael. Thank you for sharing and for your inspiring accompanying writeup. Sunrises are my favorite,however,I shoot it as it looks,none of these 4 or 5 shots then’merge’them into 1… Either you get the shot happening at the time or you don’t, then pick 1 you like the best! Your pics are pretty, like to see what you capture w/o making 6 pics into 1! But that’s just me~you either get it or you don’t,to me, that’s what makes photography so challenging!! My opinion! Karen, of course you can like what you like, for any reasons you like. Bracketing and blending exposures to achieve a greater dynamic range is a widely-accepted practice these days. The first and second photographs here are not composites. I define a composite as taking different photos from different times or places and merging them together to create a scene that never actually existed at any moment in time – like, for example, replacing the sky in one image with clouds or a sunset from another image. Rather, the first and second images here are blends – which by my definition means not moving the camera, and taking two or more images in close succession, then blending those images together to achieve greater dynamic range, or greater depth of field, or to reduce noise. So even though it’s a blend of multiple frames, the resulting photograph portrays a real moment in time that actually occurred, and would look close to what it looked like if you were standing there viewing the scene at the time. While a photograph is never the same as the actual experience, I can say that the first and second images here look close to what they looked like in real life. And I could have taken just one of the bracketed frames from either sequence and used Lightroom to produce a finished result that looked absolutely identical to what you see here, except that the image from a single frame would have more noise in the shadows, since those shadows would have to be lightened more with just one frame. You wouldn’t even be able to see the noise at the sizes displayed here, so I choose to bracket and blend exposures mainly just to improve image quality in large prints.